Year end school holidays is coming up but no planyet? Purchase an Annual Pass now and you'll be have unlimited visit to the exciting Brick-tacular holidays, watch 3D fireworks, Lunar New year celebration and a lot more all the way until 2019. Get it now and enjoy unlimited fun during this holiday season. 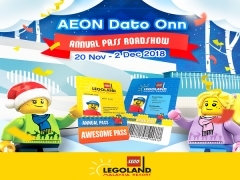 Find out more about our Annual Pass by visiting Legoland Malaysia now!